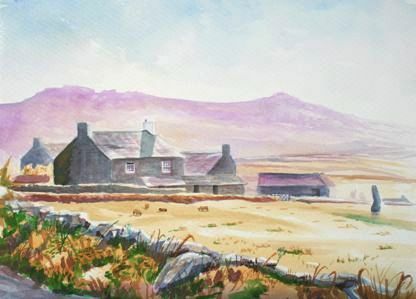 A watercolour, a very atmospheric early example of the artist Gordon Frickers work. Here we can already see the ease with which he handles light and depth, interesting to compare with his mature landscapes in the “Special Colour Vision” area of this web site. Set in a typical Cornish landscape, a typical Cornish farm in far away West Penwith, a land rich with Celtic and older legends, adorned with numerous standing stones, why has this farm retained its standing stone?